This entry was posted in Vacuum Tubes and tagged 12au7/ECC82, 5814, Raytheon by tubemaze. Bookmark the permalink. 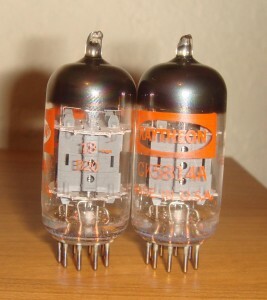 I’ve been lucky lately in finding great tubes. This time is is the dreaded Gray Plate tube; but it’s a well regarded Raytheon 5814 Windmill getter. The tube is truly unique. I has very unusual structure of the plates. Not only they have 3 holes in the middle of the plate, but also one end with a L shaped corner with a cut in the middle. Sound-wise, it’s definitely one of the best, great soundstage, very dynamic. It reminds me of the 5751 Windmill – I guess they had the same designer behind them. Great tube!!! Highly Recommended.